How many events does your organisation exhibit at each year? Trade shows and exhibitions can eat up a big chunk of your marketing budget – but unlike your other marketing channels, you get little visibility into how that investment pays off. For many organisations, being able to attribute individual leads to specific events is impossible to imagine. But events are your best – and often only – opportunity to speak to interested potential customers, face-to-face. It’s time to turn events into your best-performing marketing channel – and have the data to prove it. When your team reports back to you after their latest trade show, how much information do you get about the performance of the event? For the majority of organisations, lead generation is their top priority when exhibiting at events. But when you ask for an events report, you get a series of anecdotes about how busy the stand was, or a response based on nothing more than gut feel. It’s hard to take a strategic approach to exhibiting at events, when you don’t have the data to inform your decisions. Without any data on your events performance, it’s impossible to calculate your return on investment, or make informed decisions as to which events to go back to, and which are an unnecessary drain on your budget and team’s resources. Events, in short, are a mystery. But they don’t have to be. If you want to improve your organisation’s performance at events, you first need to be able to measure that performance. Are you capturing a high percentage of good-fit leads, or are your reps using all their time and energy talking to people with no real interest in your products? With the right tools in place, you can join-up the leads captured at each trade show with your CRM and Marketing Automation systems. Once you start connecting these systems, it becomes easier to join the dots, and attribute a source to each lead. You can see which events generated your best (and worst) leads. And if your team has a better understanding of how trade shows and events fit in with business strategic priorities, your events team can raise their game at every trade show they exhibit at. The Akkroo team works with leading organisations including IBM, PayPal and Sony, helping them to improve their lead capture and in turn generate better return on investment from their events. Collect better-fit leads from your trade shows. Focus on quality over quantity when collecting leads. Leaving a trade show with 100 hot leads will be worth much more to your organisation than coming away with 500 contacts or poor-fit leads. Join-up events with your marketing tech stack. This will make lead attribution easier, so you can more effectively track return on investment. Want to help your team generate better-fit leads at events? Want to be able to measure and report on the success of every trade show? 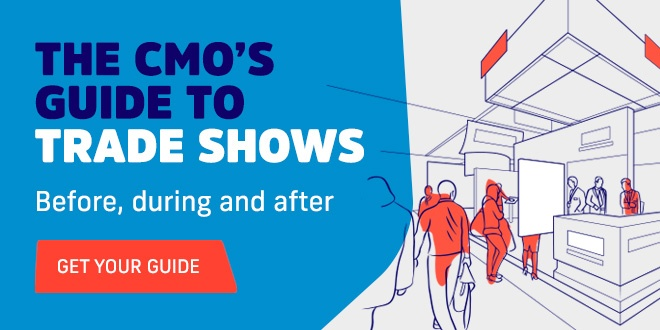 Download The CMO’s Guide to Trade Shows.